Carlton kids books are very much turning into some of our favourites in this house. They just have so much choice and something to suit everyone. We're definitely a book loving family and the more unusual the better! 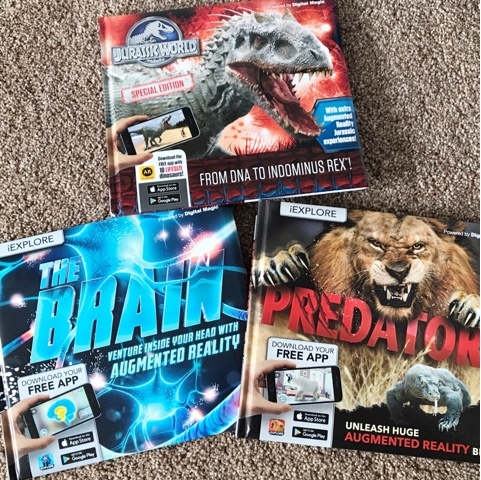 You can imagine my son's complete joy then when he received three different augmented reality books to review. 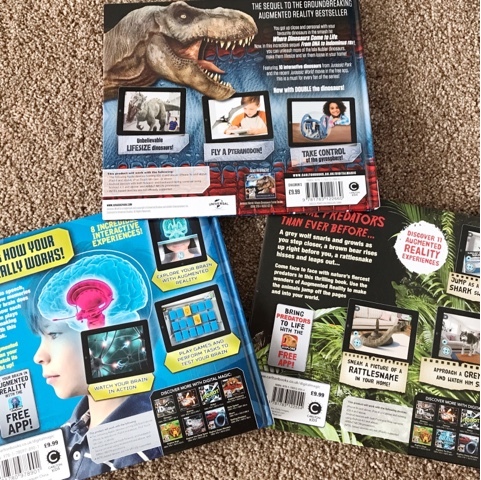 The three books received were; iExplore Predators, iExplore The Brain and Jurassic World Special Edition: From DNA to Indominus Rex! All of these books include a special AR app which can be downloaded from the App Store or Google Play. Before we go any further though I thought I best quickly explain what augmented reality is. It's basically the integration of digital information into the user's environment in real time. Unlike virtual reality, which creates a totally artificial environment, augmented reality uses the existing environment and overlays new information on top of it. Hence why AR usually uses say an iPad camera to show what would look like an object in your room/world around you which wouldn't normally be there. Each book has it's own intriguing topic so all very different and interesting. 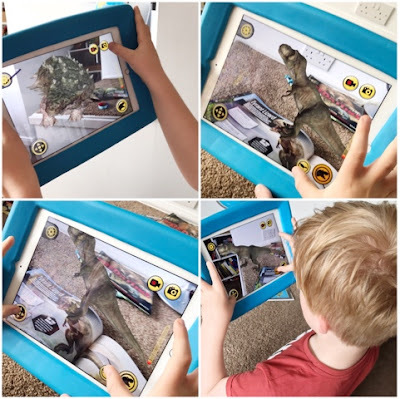 Logan wanted to start with the Jurassic World book and after downloading the app onto his iPad we got straight to it. As you can see from the photos there's plenty of reading on each page and some pages have a special AR Activation Page. This means you open the downloaded App, follow the instructions then scan the special Activation Page box and as if by magic a dinosaur will appear on screen and looks like it's in the room with you. My son was totally thrilled with this and spent a good hour flicking through the book and interacting with each AR opportunity. Once he had got to grips with that he then went back and started to read through the pages. Logan did this with each book as the thought of being able to access AR was really entertaining for him and it put a different spin on what a normal book would usually be. Adding in AR definitely makes a book more exciting and brings it to life right in front of your very eyes. Both the Predators and The Brain books were equally as exciting and fascinating for Logan with the brain scanner allowing you to see what your brain would look like, and the Predators allowing a rattle snake to strike out at you. 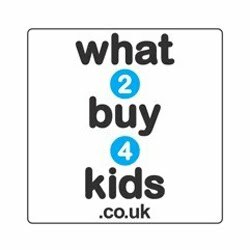 If you think these books would be perfect for your little one then why not enter my fab giveaway to win all three! It's simple and easy to enter via the rafflecopter widget below. I was sent these 3 books in return for an honest review. 111 comments on "Review & Giveaway: Awesome Interactive Carlton Kids Books"
Jurassic World Special Edition: From DNA to Indominus Rex. The Brain, educational and fascinating. My daughter would love the brain book. My son would love the dinosaur book! My niece would love the Jurassic World book! I think it would be the jurassic world book out of them all. Jurassic world will be the favourite! The Jurassic World book would be perfect for my son. The dinasaur book would be well loved. jurassic world looks so good! The eldest wants to be a brain surgeon when she grows up so would love The Brain book. Definitely the Jurassic World Special Edition: From DNA to Indominus Rex! My son would love the iExplore Predators book. 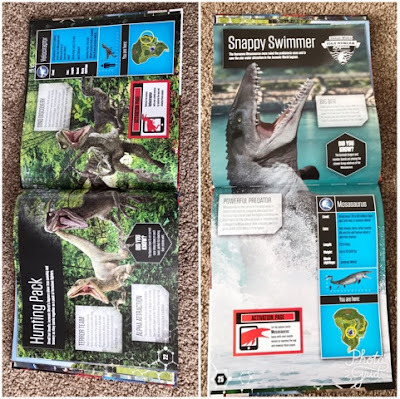 Jurassic World book - he loves dinosaurs! My daughter would like dinosaurs the best. My daughter would love Jurassic World, shes dinosaur mad! great books to get my childs interest and imagination. I think my daughter would love the iExplore the Brain book. She is fascinated by science so this would be perfect for her.